The Bronx is Burning and student riots and race riots puncture the vague stillness of routine from Paris to New York and beyond. Meanwhile Cleveland is thumpin’ with another uprising –at La Cave Cafe on Euclid Avenue, the Velvet Underground’s proclaiming its own carefree rock manifesto to the late-night counter-culture world. 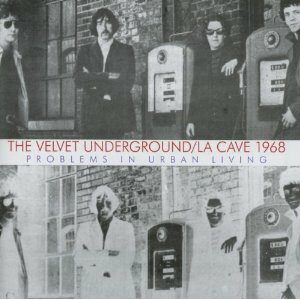 Just released in all its grainy grandeur, La Cave 1968: Problems In Urban Living documents the raw sound of riots in music form; the particulars of Lou Reed and the Velvet Underground’s revolutionary music (words, specific notes) get mixed up in the general fervor for change, for bringing in the new and de-throning the old in a grand, distorted guitar spectacle. Lou Reed and the gang fittingly kick things off with “Move Right In,” a short and nasty number with rollicking, swervy, drunken rhythms and a volcanic pile-up of noise and energy and ash at the end. The next tune, “I Can’t Stand It,” is unfortunately muddled by the same sound mixing problems that muddle most of the album; the words get lost behind the boiling distorted, but care-free inferno of guitars, drums and bass. Rather than crystal-clear music from a lost time, we get a feeling, an experience, something unquantifiable. This, like the rest of the album, comes across as the bottled-up sounds, smells and sensations of live music, muddled by bad sound systems, a few drinks and the general haze of a night out in the city. It’s that cheap wine you’ve saved until after you’ve polished off the centerpiece bottle. As a listener you’re no longer after a definitive taste, but seeking communion with that ineffable feeling we call rock and roll, or change. Like any lively bar, the band plays second fiddle here to drink and conversation at times. In “Pale Blue Eyes,” Lou Reed stops midway to ask the sound men to turn the microphones on, which begs me to ask the question that’s been on my mind throughout the album: is this merely a rock and roll artifact, something for study and amusement, or something that can, despite its lackluster mixing and distorted sound, provide as much repeated listening pleasure as say, Velvet Underground the studio album does? La Cave is something that any Velvet, or for that matter, any fan of rock, should listen to and decide for themselves whether this is just archaeological noise, or cold, hard, habit-forming rock intoxication.